Have I told you how I felt about Patrick Comiskey’s speech about the state of American Syrah at the opening of the Celebrate Walla Walla wine event in June of 2014? If you follow this blog or follow me on Twitter with any regularity, you already know, I loved it. Patrick really nailed something that I’ve been trying to put into words since I started the blog. He makes the point that at its essence Syrah, when grown in the right places, has a wild character. Its flavor profiles are weird sometimes and that’s how we need to think about Syrah. It’s exactly this dose of strangeness and uniqueness that the wine world needs. We are no longer craving overripe, overly smooth and inert Cabernet, we are craving wine that makes us think and makes us salivate to learn more and that’s what Syrah does. That’s what makes it so dang intriguing and why, after tasting Syrah on a weekly (usually more) basis over the last five years, I keep coming back for more. 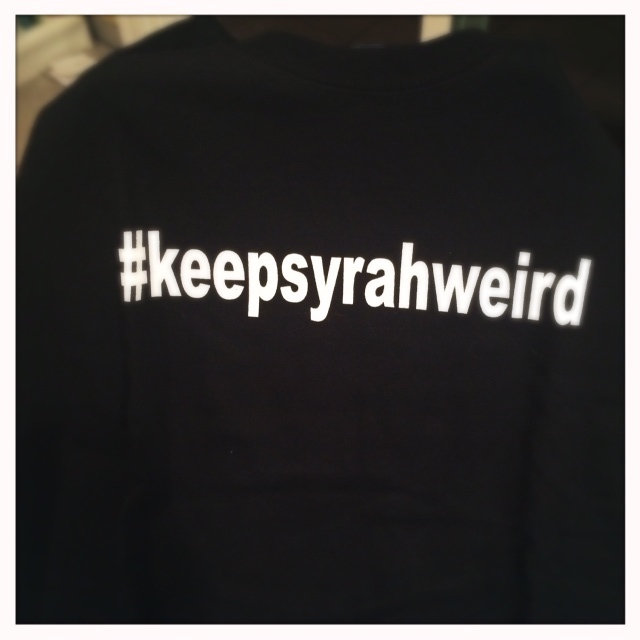 Based on Patrick’s speech, Ryan Sherman of Fields Family Wines in Lodi came up with the idea for the hashtag #keepsyrahweird. I’m happy to say we’ve even had shirts made. I love the idea of embracing Syrah’s inner strangeness and twisting it on its head to make it positive. It’s in the spirit of this embrace of cool-climate Syrah’s weirdness that I write about one of Samsara’s wines. Samsara is the brain child of Chad Melville of Melville Estates. He makes Pinot, Syrah, and Chardonnay for his family’s label but also has a side project devoted to cool-climate Syrah and Pinot from small sites. You only have to glance at the wall of empty bottles of Northern Rhone Syrah on the wall behind Samsara’s little tasting room in Lompoc to realize that Chad’s serious about making interesting new world Syrah. Samsara’s winemaking is a very low-intervention style. The grapes are fermented with native yeasts and slowly and gently pressed, the resulting juice kept in French Oak Barrels for 24 months. The wines are bottled unfined and unfiltered. The wine: There’s an herbal element in the background that reminds me of celery soup mixed with day old meat, sweet plum and tobacco. On the palate the wine has a combination of beautiful acidity and softness with lift on the finish and well integrated tannins. Weird, right? And I wouldn’t have it any other way. I urge you to check out the rest of Patrick’s speech here on his blog and of course to search out more examples of Syrah that embrace its wild and weird side. Nice! 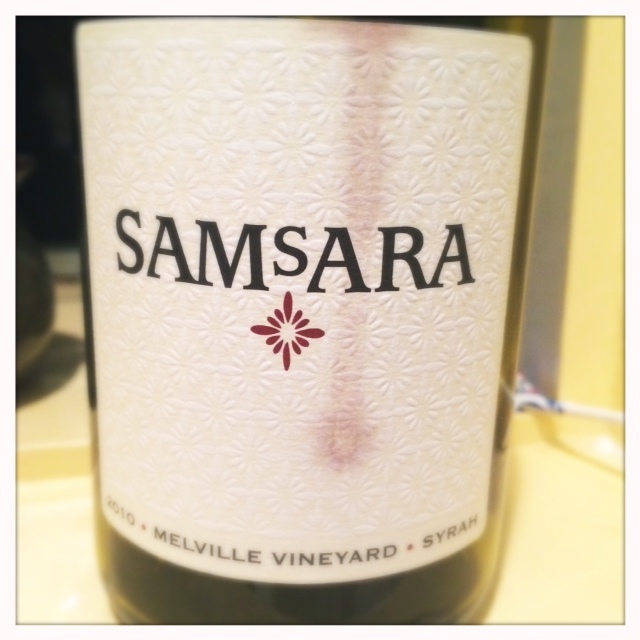 Great wine, Samsara keeps the Syrah train rollin’. So where do I get a t-shirt? Got one with your name on it Martin. Anytime!